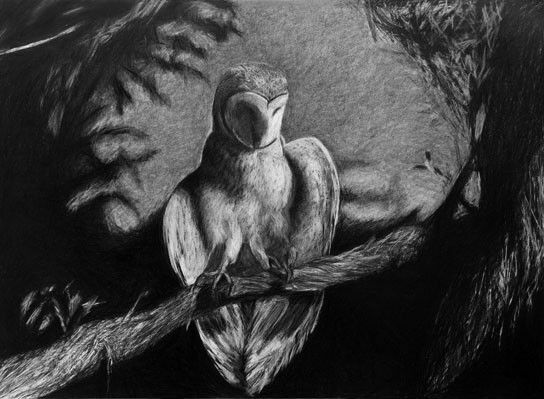 Herrick Gallery is proud to present It’s A Hard World For Little Things, an exhibition consisting of two series of large-scale graphite drawings on paper and three sculptures by C.A.Halpin. The works are inspired by the title of a scene in the film The Night of the Hunter. The exhibition was originally conceived as a multimedia show, with a choreographed performance and musical score at Angus-Hughes Gallery, London, 2015, with the second part at the V&A Museum of Childhood in 2016. This new show at Herrick Gallery will be the first time that all of the drawings have been shown together. 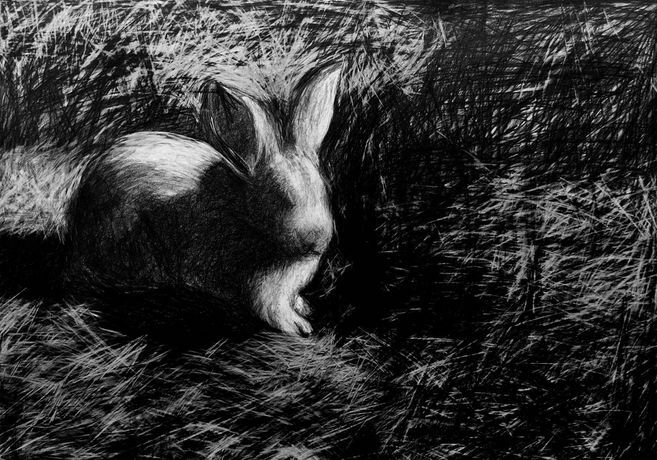 The first set of drawings depicts an owl stalking a young bunny in the dead of night. The owl’s wings stretch as it leaves its perch to swoop down onto the unsuspecting creature below. The drawings animate the scene with images taken directly from the film. The drawings are black and brooding with the graphite pushed into the paper with physical force, while the white marks are dragged from the background as they are rubbed and wrought from the intensity of the oily black waxy marks. The second series of drawings explore the concept of the sentence ‘It’s a hard world for little things’, uttered by Lillian Gish, the aged heroine of the film, who saves the children from a bad end. There are three sculptures to accompany the drawings, two black painted figures, made from found stuffed toys sewn together and sculpted to form the character of Preacher and his horse who follow the children as they flee from danger. There is a third piece which is a rag doll stuffed with dollar bills, this piece represents the burden that the children in the film carry and what puts them in danger. The use of children’s toys to produce the monster that haunts their dreams and lurks in the shadows of every child’s imagination, that of the bogeyman. The Night of the Hunter directed in 1955 by Charles Laughton, is a mother goose tale of good and evil, set in the Great Depression of 1930’s America, seen through the eyes of two runaway children as they flee from the harmful grasp of their menacing stepfather, along the great Ohio river. This black and white expressionist style film was slammed by the critics of the day causing Laughton never to direct another film. The film stars Robert Mitchum as Preacher Harry Powell and Lillian Gish as Rachel Cooper, with Shelley Winters as Willa Harper. The film was received in later years as a seminal work that has influenced directors such as Martin Scorsese, Fassbinder, Spike Lee and the Coen Brothers. In 1992 it was selected by the US the Library of Congress for preservation in the National Film Registry deemed ’culturally, historically or aesthetically significant’. Halpin has been a practicing artist since 1983 and has worked in a broad spectrum in 2D, 3D, moving image & performance. She has exhibited widely and has lived and worked as an artist/animation director in London, Barcelona, Madrid and Paris. Halpin also ran The Outside World Gallery from 1996-2012, a small independent artist led space in Shoreditch. She has an M.A. in Illustration from the Royal College of Art and C.N.A.A. Postgraduate Diploma in Specialist Printmaking from Brighton Polytechnic and has also completed artist residencies in England, Spain and France. Recent exhibitions include The Hands of Dead Celebrities, The Bargehouse; Finding 50 Fridas, East End Prints; It’s A Hard World For Little Things #2, V&A Museum of Childhood; It’s A Hard World For Little Things #1 Angus-Hughes Gallery; The Invisible Woman, Hantverk Found Gallery, Margate.